A spacious light apartment in a typical building late 19th C building, a quiet residential setting still sought after by Parisian society. Montparnasse! The stamping ground of Hemmingway, Scott Fitzgerald, Alice B Toklas, Sartre, Simone de Beauvoir -- as well as numerous artists and jazz musicians. Their memory lingers! The restaurants Closerie de Lilas, La Coupole have changed little since their day. The Jardin de Luxembourg is just a short walk away, as are the Boulevards St Germain and St Michel. Numerous pavement cafés and restaurants border the elegant tree-lined boulevards. 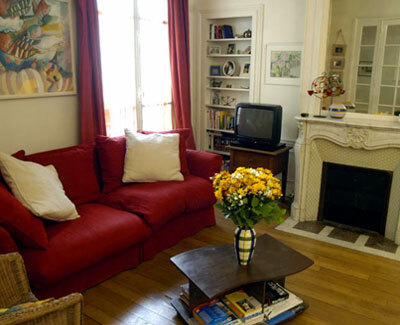 Approx 10 mins by direct metro to the Ile de la Cité, Notre Dame, Ile St Louis and the Marais. Direct RER link from Port Royal with both Orly and Charles de Gaulle airports. A spacious light apartment in a typical building late 19th C building, a quiet residential setting still sought after by Parisian society. Tall windows, marble fireplaces (not in use!) and polished parquet floor are very typical features of this period. Overlooking two courtyards (protected from street noise!) the apartment is pleasantly decorated, good quality contemporary furnishings. Entrance hall leads to pleasant Sitting room, two comfortable sofas (including one single sofabed), TV, pretty marble fire place. Eat-in Kitchen, well equipped included Dishwasher, Washing machine, microwave and regular oven. A passage leads to both bedrooms, Bedroom 1: double bed. Bedroom 2: 2 single beds. Also to large dressing room and Bathroom with tub and shower attachment. Sep. WC. Local line telephone. Gas central heating. Initial linen supplied.